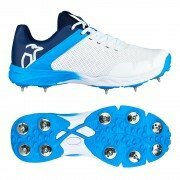 The 2019 Cricket Shoe range by Kookaburra now available from All Rounder Cricket. Fully endorsed by current England legend Ian Bell, also A.B. De Villiers and Jos Buttler. Kookaburra 'cage' technology offering essential anke support. Newly designed outsole providing superb traction. Water resistant durable upper with the very latest in breathable mesh construction. Advanced EVA midsole for superior shock absorption. Integrated padded tongue for improved comfort and fit. Lightweight insole with heel and front support to reduce shockwaves. Premium spike outsole (rubber cleats available seperately). Contemporary Micro lightweight athletic shoe design. Combination breathable nylon and durable plasticised mesh upper. Ergonomic slip last provides enhanced athletic performance. Critically acclaimed low profile Durafoam midsole. Thermal Flex heel counter provides custom fit support. Dual Option - Spike and Half Spike (20 lightweight Nickel plated spikes and 8 Rubber cleats included). 7 to 12 (full sizes only). Combination PU and Mesh upper. Athletic style slip last for comfort and support. Low profile midsole providing superb shock absorbency and comfort. Thermo Plastic Heel Counter for increased support. 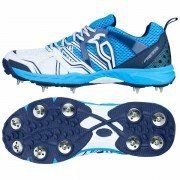 Glide around the field with style, comfort and support you can only get with Kookaburra equipment.